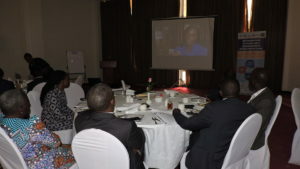 Ahead of the Universal Health Coverage Day on 12th December 2018, the African Palliative Care Association (APCA), Uganda Network on Law, Ethics, and HIV/AIDS (UGANET) and Palliative Care Association Uganda (PCAU), organized the above meeting with support from the Open Society Initiative for Eastern Africa (OSIEA) and Open Society Foundations. 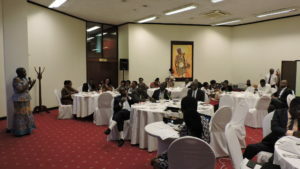 The meeting took place on the 22nd November 2018 at Kampala Serena Hotel in Uganda. 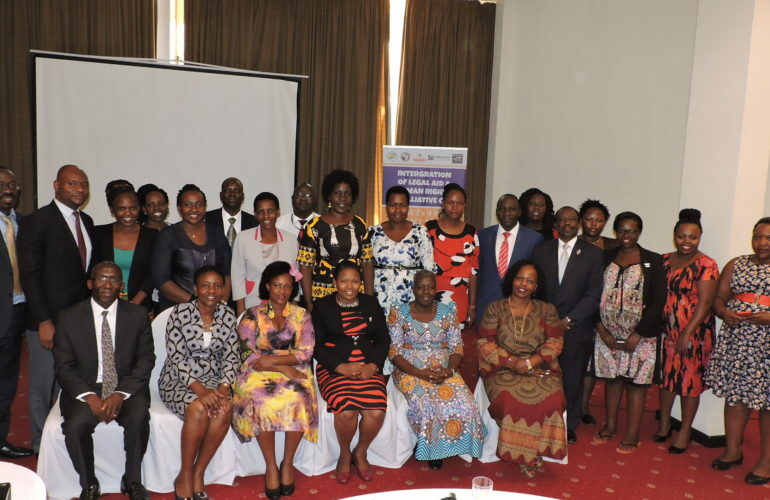 The meeting aimed to engage Honorable Members of Parliament of Uganda on issues of palliative care, which is a core component of Universal Health Coverage (UHC), but also a basic health service that can be integrated in the health system to achieve UHC. According to the World Health Organization (WHO), UHC means that all people have access to the full spectrum of essential, quality health services they need (health promotion, prevention, treatment, rehabilitation and palliative care) without the risk of financial hardship when paying for them. Other participants included 6 staff of Parliament and 15 officials from civil society organizations involved in palliative care (advocates, service providers, educators and service beneficiaries). The Uganda Ministry of Health was represented by the Chief Pharmacist. 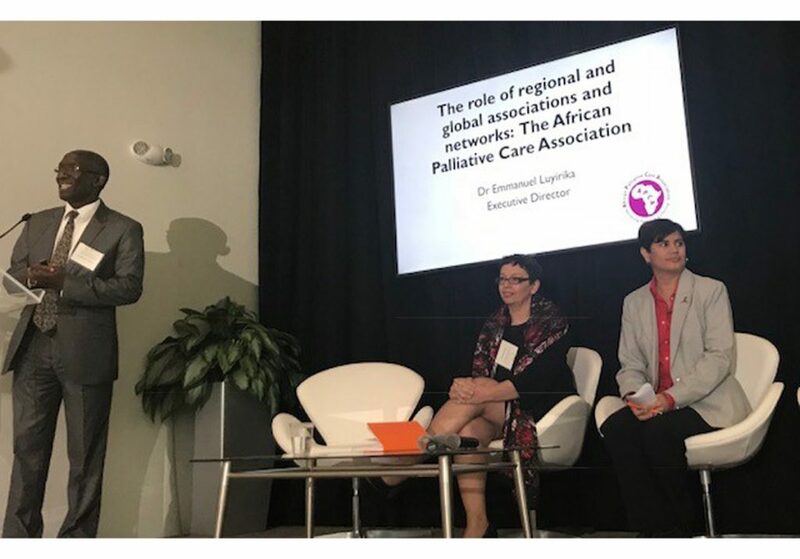 Dr Emmanuel Luyirika, Executive Director of APCA shared the global and regional updates on palliative care, including the commitments supported and signed by the Uganda Government. He also shared latest evidence on the need for palliative care. Rose Kiwanuka, Country Director of PCAU shared an overview of access to pain relief and palliative care in Uganda: progress, gaps and recommendations. Ms Dora Kiconco, Executive Director of UGANET shared results from an assessment of human rights issues affecting the provision and access to palliative care in Uganda. 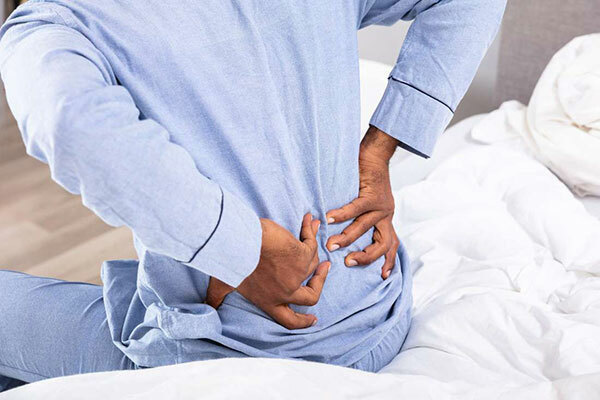 Palliative care (PC) addresses the pain and suffering associated with serious chronic illnesses, and there is strong evidence showing that early PC interventions improve survival and patient outcomes and should be provided from the point of diagnosis. Many persons continue to die in pain and without dignity because they cannot afford or access palliative care services. A number of persons experience bankruptcy due to medical bills for palliative care, especially in the case for a cancer diagnosis. A study conducted by Lancet Commission shows approximately 120m people go bankrupt annually treating cancer. Different countries have had different interventions at national level for palliative care. Only 11 of the 53 African countries have a standalone national palliative care plan, program or policy. These include: Rwanda, Swaziland, Mozambique, Zimbabwe, Botswana, Malawi, Tanzania, Ethiopia, Libya, Guinea and South Africa. 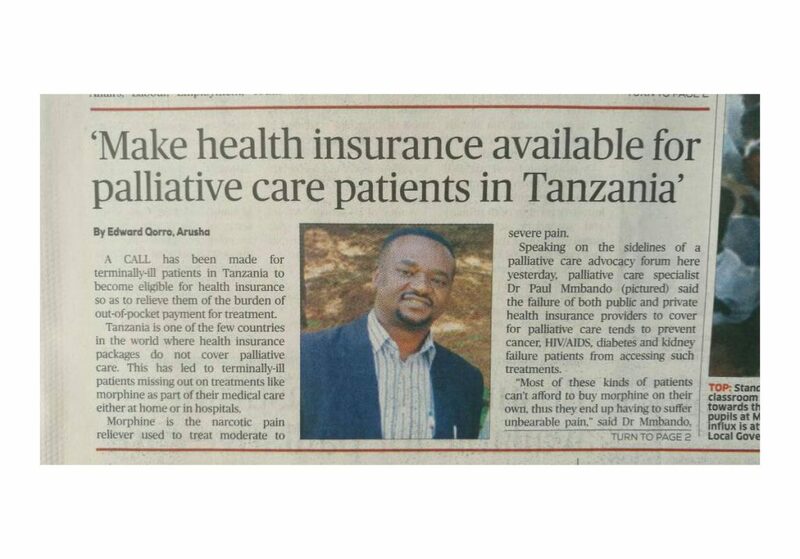 In Rwanda, palliative care is included in the National Health Insurance and is accessed free of charge by all patients in need. The Government of Uganda, on the other hand meets the cost of oral liquid morphine used in the management of moderate to severe pain experienced by patients with PC needs. Uganda is recognised globally for its leadership in the integration of PC in its health system. “There is no hospice in the whole of Acholi region, yet we have over 3,000 children of nodding disease and need extensive care”. Hon. Lucy Akello, MP, Amuru District, Member of HIV/AIDS and Gender, Labour and Social Development Committees. “Some of us may not see palliative care as necessary but some of us have lost relatives who needed and benefitted from the service. I accessed palliative care for my relatives from Hospice Tororo and have since supported the Hospice in different ways”. “This is the most appropriate time for this meeting. The elderly, who need to benefit from palliative care are isolated. I support the need for human resources to make pain relief more available. A lot has to be done as access is still limited”. Hon. Rwabwogo Sylvia, Kabarole District. “There is no palliative care at all in Sironko. 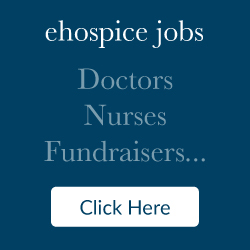 If we have as many patients as possible accessing palliative care, this would give them hope. Our people are dying un-noticed. My area has a hilly landscape and this makes access to health care a challenge”. Hon. Wamala Nambozo Florence, Sironko District, Vice Chair, HIV/AIDS Committee. “I nursed both my son and my parents. My son accepted to take morphine for his pain, and even moved from the weaker to stronger morphine as his pain was too much. Palliative care is really required. At one time I had four patients with cancer in my house. My son would drive me if he took his morphine”. Flavia, family care giver. Government intervention is imperative to ensure palliative care is available, accessible and affordable to all persons who need it. Only about 11% of the need for palliative care is currently met. A number of MPs shared their personal experiences of situations where family members needed palliative care and did not know how and where to access it. For example, the Acholi region was cited not to have any hospice and palliative care services despite having more than 3,000 children with nodding syndrome. Sironko was also cited as one of the areas with no palliative care services. Quality of services require further improvement according to the UGANET assessment. A draft policy to guide the national implementation of palliative care exists and has taken years without being passed. Inadequate numbers of skilled health care workers to deliver quality palliative care services, coupled with the lack of recognition and appropriate deployment by Public Service for health care workers with PC qualification. The national health insurance scheme/package must palliative care and should require no payment by patients at the point of access. The urgent need to pass the national palliative care policy, as Uganda is losing its leadership position in the world. Countries that have drawn lessons from Uganda have already passed and are implementation their national policies on palliative care. There is need to increase funding for health and allocate funds for PC activities at all levels of the health system – national and local government level. The country is yet to achieve the Abuja Declaration by allocating 15% of national budget towards health. Recognition of PC as a specialty by the Public Service Commission and undertaking appropriate deployment for those with qualifications to increase recruitment and retention of skilled health workers. Promote home-based PC and address the growing problem of the palliative care needs of the elderly. Paying attention to the needs of women as the main care providers of the sick at the family level and bear the bigger burden. Increasing skilled human resources for PC, including the training of undergraduate students. Empowering VHTs in PC would enhance human resources for PC. Planning access to PC in hard-to-reach areas such as Sironko. Doing due diligence for the appropriation of resources towards palliative care. The Ministry of Health and Civil Society organisations were tasked to present a budget to Parliament, and were advised that the budgeting process is starting soon. Formation of a palliative care forum for Members of Parliament. This forum would champion the palliative care cause in Parliament. Opening of a Whatsapp group on palliative care for Members of Parliament in attendance of the meeting. Include palliative care on the agenda of the different committees of Parliament. Make follow-up with MPs to achieve the above recommendations and commitments. Support MPs with required information for their deliberations on palliative care in Parliament, including a budget for palliative care activities. 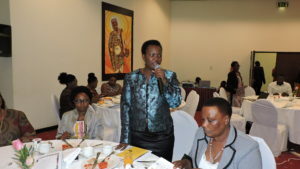 Follow-up on issues of access to palliative care in areas which were highlighted by MPs as not having any services, including Acholi and Sironko, planning for the elderly and hard-to-reach areas. Arrange a follow up meeting to expound palliative care and draw out the actions to be taken to ensure palliative care budgeting at national level.